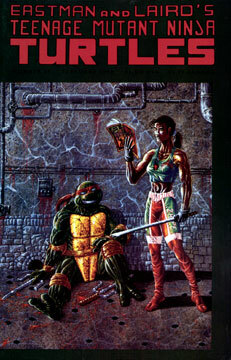 Raphael is meeting in secret with Lucindra, an inner city female martial arts expert, to spar. As the two practice their fighting skills on one another in the sewers, the woman asks Raph if he ever has problems with his brothers, and the Turtle states “Always.” Lu acknowledges that she’s also having problems with her brother. The woman gets the best of Raph, beating him in 4 out of 5 bouts when she announces that she has to leave for work. The Turtle is upset over her departure and demands a rematch for the next day. Raphael returns to the lair where he’s admonished by Leo for missing the team workout. The terrapin teen is distraught over losing his matches with Lucindra. To make matters worse, Lu told Raph that he “fights like a turtle” and its really getting under his skin. Raph won’t tell his brothers the details of what he’s been doing, only that he lost a fight with a girl. Meanwhile, Lucindra walks home through the rough neighborhoods of New York City, where she meets up with a man who warns her that her brother needs to pay his debt… fast. Lu tells him to drop dead. When she gets into her apartment, Lu finds her brother on the couch, asking to borrow money from her. Lucindra tells her brother she’s through solving his problems for him and it’s time that he did it himself. The next morning Raph and Lu meet in the sewers again to spar some more. The duo head deeper into the bowels of the city when they’re attacked by a horde of Foot. A fierce battle breaks out and Raphael is taken down with a barrage of shurikens. Lucindra manages to fight off the remaining Foot soldiers and carries Raph off in an escape effort. The female martial artist is also suffering from her wounds, and she backs into a corner, preparing to fight to the finish with another group of ninjas that are approaching. However, Lu is quickly knocked unconscious. Fortunately for Raphael and Lucindra, the ninjas are none other than Leo, Mike and Don, who have come in search of their brother. Leonardo notes that the shurikens used on the pair have been poisoned. They return their fallen brother and his comrade to their lair, where Splinter heals them with a special tea. Raph asks Lucindra to train with the TMNT, but she respectfully declines the offer, stating that she doesn’t want to become a ninja and be a fighter the rest of her life. She says that she has too much life to live and that she must take care of her brother. Lucindra then departs, leaving Raph with a necklace for a memento.